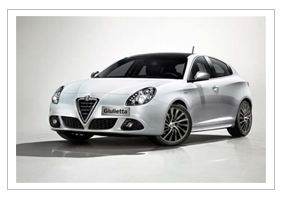 The Alfa Romeo Giulietta is a compact five-door family car with distinctive coupe styling. The model first made an appearance in the 1950s where it earned plaudits for its sporty appeal, attractive looks and competitive pricing. The Bertone coupe began the Giulietta dynasty, but its superb engine, handling, and great value were present in all the body styles including the Saloon in 1955, the Spider in 1955, the Estate in 1957, and even a ceremonial model by coachbuilder Colli. When launched in 1954, the four-cylinder engine produced 80bhp from just 1290cc giving the car a top speed of 102mph. At the time, this made the Giulietta a potent competition car. The engine was modified in 1956 with Alfa increasing power by 10bhp and the Sprint Veloce model was launched giving a top speed of 112mph. The Giulietta was still competitive seven years after its launch with the Ti saloon winning the 1300cc class of the FIA Grand Touring Championship, beating much more modern cars. The Giulietta altered the public perception of Alfa Romeo more than any other model making it far more accessible to the masses than had previously been the case. The latest version sits on an all-new compact platform that includes a combination of advanced engineering and technical solutions. It is in a segment of the market that now contributes one out of every four new cars sold in Europe. The modern Giulietta offers a range of five new engines – all of which are turbocharged and Euro 5 emissions compliant - consisting of three petrol and two diesel. The smallest capacity, a 1.4-litre, offers 120bhp while the 170bhp 1.4-litre TB MultiAir has low emissions and fuel consumption for a petrol engine with this power rating. The 105bhp JTDM-2 engine uses second-generation MultiJet technology while the 2.0-litre is another second-generation MultiJet diesel. All these power units combine Start&Stop technology and a gearshift indicator. The most powerful engine in the range is Alfa Romeo’s new 1750 TBi petrol unit. The Alfa Romeo Giulietta comes with deadlocks and marked parts on every version, while Lusso models and above have an alarm. The Giulietta is fitted with electronic safety aids such as stability control – plus front, side and curtain airbags and active anti-whiplash front head restraints. In the UK, Alfa Romeo sold 7,113 Giuliettas in 2011 and has sold over 10,000 since launch. In Europe, Alfa Romeo sold 80,000 vehicles in 2011, and worldwide orders for the Giulietta have totalled almost 140,000.